Probably more than you ever wanted to know…. Originating in France, just east of Paris, this popular cheese is named for the market town around which it was first made. It is a soft-ripened cheese which means that the cultures begin their work on the outside of the cheese ripening inward and manifesting themselves in the soft white surface mold for which the cheese is famous. Brie is a healthy food choice that is lower in fat than most cheeses and is also naturally low in carbohydrates. Once the cheese curds ( which is really just coagulated milk) are firm enough the leave their mold, their surface is inoculated with Penicillin candidum, a mold that in a few short weeks will completely transform the bland chalky interior into a soft creamy paste with a subtle, earthy flavor that some say reminds them of wild mushrooms. 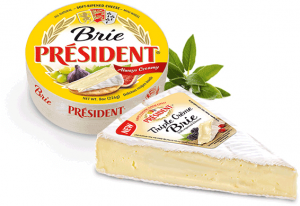 Brie is typically sold either in whole wheels or in individually cut and wrapped wedges. For gift baskets that cannot be refrigerated, we use a shelf-stable brie spread. What is the best way to serve Brie? Brie should always be served at room temperature. Let the cheese stand covered (best left in its wrapper) for at least 30 minutes to one hour prior to serving., If serving a whole wheel slice it in wedges like a cake. The white mold on the outside of the cheese is safe to eat. Most people like it while others discard it. It’s up to you. It pairs beautifully with the tart taste of dried cherries, cranberries, apricots or raisins. Brie also complements toasted nuts, such as walnuts, pistachios, almonds and cashews. Try Brie slices for a tasty twist in cheeseburgers or melted on croutons for use in soups and salads. Brie also works well in sandwiches such as with sliced apples and smoked turkey/ Brie goes with a wide assortment of wines, from champagne to hearty reds as well as beer and cider. Buy only as much Brie as you will consume in two weeks. Once opened, keep refrigerated and tightly wrapped in foil or plastic. Brie should never be frozen.